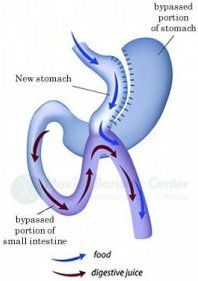 The Gastric Banding is a purely restrictive surgical procedure in which a band is placed around the uppermost part of the stomach. This results in a small pouch above the band and the main part of the stomach is below it. The band guards the channel between these. The pressure of the band triggers the stretch receptors of the stomach, causing early sensation of fullness. The aim of band adjustments is to reach the green zone where you feel satisfied after a small meal and are not seeking food between meals. It is possible for the band to be too tight as well as under filled and both of these situations will lead to inadequate weight loss and potential complications. 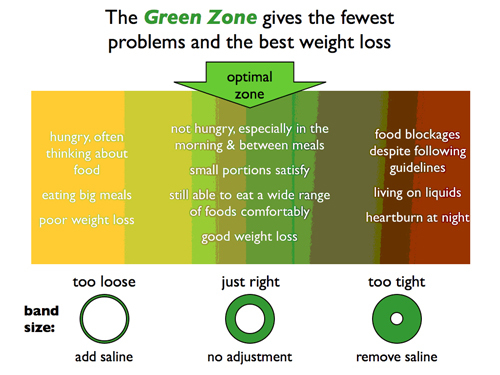 When at the green zone, you should be able to eat a wide variety of solid foods. The band is not inflated at the time of surgery. Your first band adjustment will be at 5-6 weeks. You will need to have the band adjusted from time to time as your weight loss progresses. With this procedure the structure of the stomach and intestines are not altered, so digestion and absorption remains normal. You can expect to lose roughly 40-50 per cent of your excess weight. The amount of food that can be consumed at a meal is restricted. Food passes through the digestive tract in the usual order, allowing it to be absorbed fully by the body. The band can be adjusted to increase or decrease restriction via an access port in your belly wall. The band can potentially be removed in the future. The aim however, is to leave in place for life as removal will result in weight re-gain. Weight loss may not start for a number of months after surgery until the green zone is reached through adjustments. Surgery will not affect emotional hunger and this needs to be addressed through psychological treatment and support. The band may erode into the stomach wall. The band may move or slip. 10 per cent of people fail to lose weight with the band. Weight loss is slower than that following Roux-en-Y gastric bypass surgery but recent evidence has shown similar weight loss outcomes after five years. You won�t be able to take whole tablets or capsules � all medications will have to be in liquid, crushable or injectable form. You should take a multivitamin on a daily basis. Successful weight loss requires dietary changes, exercise and self-control. In this procedure, the surgeon creates a small gastric pouch of approximately 30-60ml. The small bowel is then divided and the end brought up and attached to the gastric pouch. 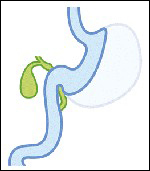 In this way, food passes into the pouch and straight down into the lower part of the small bowel. The rest of the stomach and the bypassed part of the small bowel are then re-attached further down. This ensures that the gastric and pancreatic juices enter the small bowel and digest the food. Whilst most of the stomach and upper part of the small bowel is bypassed there is not a significant reduction in the amount of calories and protein absorbed. Most of your weight loss is down to eating less. But patients may develop vitamin and mineral deficiencies - you will need to take tablets daily including a multivitamin and mineral, calcium and vitamin D, Iron, as well as have quarterly vitamin B12 injections. Weight loss starts from the time of surgery and can be rapid within the first 6 months. You can expect to lose roughly 70 � 80 per cent of your excess weight at 2 years. In most cases, further surgery is not required. Patients report decreased hunger and appetite due to hormonal changes. Has the highest and fastest remission rate for diabetes (type 2). It will be necessary to take regular iron, calcium, multivitamins and B12 supplements. A condition known as dumping syndrome can occur from eating too much sugar or large amounts of food. While it isn�t considered a serious health risk, the results can be very unpleasant. Symptoms can include vomiting, nausea, weakness, sweating, faintness, and, on occasion, diarrhoea. Some patients are unable to eat sugary foods after surgery. Whilst it is possible to reverse the procedure it is technically very demanding. Complications include leak, ulceration, stenosis and hernias. Regular blood tests are required after surgery. In this procedure, the surgeon creates a narrow tube-like stomach and removes the remainder. Hence, the capacity of the new stomach is much smaller than the original. In super obese patients, it may be offered as a first stage procedure. A second stage procedure is then offered after the patient has lost some of the excess weight to make this type of surgery safer. Sleeve gastrectomy patients may develop distressing reflux in 10% of cases after surgery. In 30% to 50% of patients, substantial weight regain may occur in the long term (5 to 10 years). In this procedure, the surgeon creates a small gastric pouch of approximately 60-100ml. The small bowel is then brought up and attached to the gastric pouch without dividing. In this way, food passes into the pouch and straight down into the lower part of the small bowel. You can expect to lose roughly 70 per cent of your excess weight at 2 years. It is easier to perform than a RY Gastric Bypass operation. Some patients may develop reflux � hence it is not offered to those having a pre-exixting hiatus hernia. What happens after I have been referred? What happens when I am placed on the waiting list?